For the past 50 years, the Sudbury District has been a trend setter in providing a sport (flag football) that offers a unique opportunity for high school girls to participate in, that has traditionally been a "boys only" sport. It is estimated that approximately 500 girls participate on Flag Football teams in this district each year. While many of these girls are endowed with exceptional athletic ability, many are not. These are the girls that, if not for Flag Football, would not participate in any high school activities. 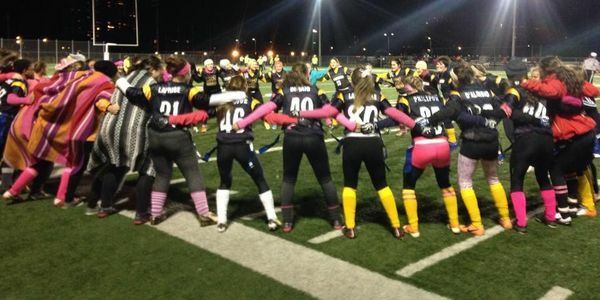 Flag Football gives these girls a sense of belonging, not only to the team, but to their school. It helps them develop confidence and a sense of well-being and pride. This in turn often provides incentive to attend school and work harder in their studies. If Sudbury was to abandon our current 12x12 system of Flag Football (and perhaps switch to the 7x7 system), it would mean that approximately 300 girls would no longer be able to participate in Flag Football. It is for these girls that we want to save our 12x12 contact Flag Football. With the success of the Toronto District School Board in mind, (who will permit the 12x12 girls season to continue) we hope to share in their accomplishment.